The Department of Trade and Industry (DTI) found 85 counts of pricing over suggested retail prices (SRPs), as it increased the number of monitored establishments from 400 to 600 weekly. The 85 counts (referring to product/s in stores) were immediately issued letters of inquiry (LOI), where prices on 77 items were immediately corrected back to SRP levels. These were considered minor violations as the actual prices were above SRPs by a few centavos. The other accounts will be apprehended should they fail to respond and correct their pricing. Price monitoring activities were intensified following the directive of President Rodrigo Duterte to ensure that prices of basic necessities and prime commodities (BNPC) are within the SRP. The monitoring teams now cover at least 120 firms a day. At the same time, DTI Regional/Provincial offices also conduct regular monitoring of prices in the provinces covering 500 more stores. “Since the implementation of the TRAIN Law, no LOI has ripened into a Formal Charge because the firms have immediately adjusted their prices to SRP. 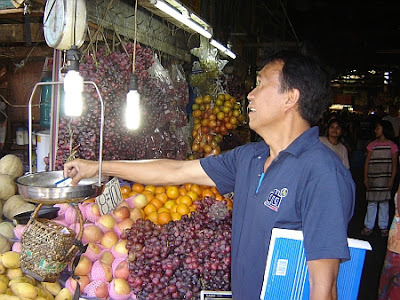 These supermarkets and groceries have been compliant after receiving an LOI,” Trade Secretary Ramon Lopez said. DTI reminds all establishments that administrative fine of up to Php 1M shall be imposed to firms committing any illegal act of price manipulation, specifically profiteering. This offense may also result in criminal liabilities and penalties. Nevertheless, except for these cases, prices have remained stable based on price monitoring. “To be exact in the reporting, we have compared ACTUAL PRICES in June 11-15, 2018 vs. November 2017, and not only the SRPs for BNPC. Out of 101 SKUs in basic necessities covering canned sardines, milk, coffee, detergent bars, bread, instant noodles, and bottled water, only four showed minimal price increase of 1-7%,” said Sec. Lopez. For prime commodities like canned meat products, condiments, bath soap, and battery, out of 43 items, only 13 posted increase of 1-8% range, mostly in canned meat category due to higher tinplate costs worldwide. These are actual price survey database. “We also compared SRPs during the two periods and there were SRP changes in 26 SKUs out of total 144 SKUs for combined BNPC, but 11 of the 26 items kept the same actual prices despite changes in SRPs,” he added. Meanwhile, the trade chief reiterated that while he understands the plight of the workers, the requests for wage hike will be left with the Regional Tripartite Wage Board (RTWB). “This matter really depends on the economic situation per region, such as inflation in the respective areas and other factors, such as the supply and demand for workers. The various RTWBs are already deliberating this matter,” said Sec. Lopez. “We call on the labor groups to join us in achieving this more sustainable solution. Let’s show the investors that this is a country with industrial peace where workers are productive, highly-skilled, knowledgeable, and industrious. We are your partners in uplifting the lives of each and every Filipino and sharing the economic gains of the country to all,” he concluded.